Tart, yet sweet apples, juicy chicken, crunchy celery and savory green onions are dressed in a tangy dressing to make the ultimate chicken salad! You make it the day before so it’s perfect for lunch on-the-go. It’s also a great way to use up leftover chicken, and kids will have a blast helping to make this in the kitchen! I live in the state of Washington, where the state fruit is the apple! 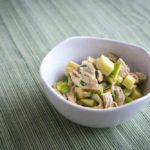 I love using tart and sweet Granny Smith apples for my grandma’s chicken apple salad, which is sweet, savory, tart, and creamy. The awesome thing about this recipe is that you can make it the day before so the flavors have time to meld together. Then, all you have to do is pull it out of the fridge right before your party! Combine the salad ingredients in a big bowl. Prepare the dressing: Place the eggs, salt, garlic powder, dry mustard, pepper, and vinegar in a food processor. Pulse until everything is combined. While the food processor is running, slowly drizzle in the olive oil for a thick, creamy dressing. Warning: The dressing by itself doesn’t taste great; actually, it’s a little bitter. 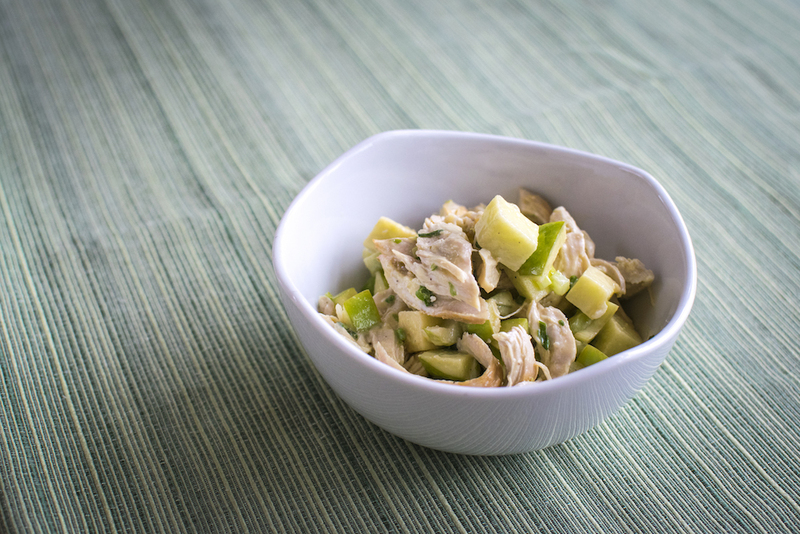 But once it’s had time to sit with the apples, celery, chicken, and green onions, it becomes amazing! Refrigerate overnight. The next day, adjust the seasonings if necessary and serve. My 11 yr old daughter made this for dinner last night. It was really good and so tasty. You are right better the next day. This salad is just perfect for an Australian summer.